How is a victory made? I’m trying to think of what makes this win against Essendon feel the way it does. Probably some seven weeks ago, Damien Hardwick was asked what the team needed to get out of the season now that it was effectively over –i.e. having no chance of making the finals. He replied to say, ‘we need to win. 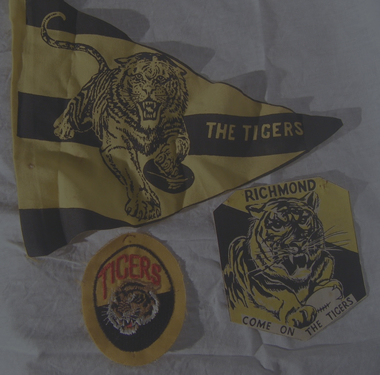 We need to give something back to the fans.’ He also said that the Tiges were a better side than what they seemed to be by their 3:10 record. This was a risky statement to make. It would have been easier for him to talk in generalisations, about improving more generally so that they would be able to be in their best form for 2015. But, he put it simply: wins on the board, now. Ugly, boring, grinding – matter. The first five wins of this streak have been underwhelming and forgettable. The thousands of disappointed fans and members have been slow to get back on board – burnt by the early to mid season listlessness of the team. Perhaps they have been somewhat unconvinced by the pedestrian nature of the wins, coming against team playing beneath their best. 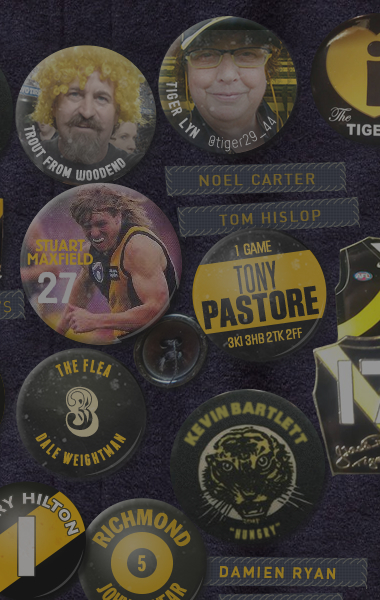 Imagine, for example, if the Tiges had beaten Port Adelaide at the Adelaide Oval in the middle of their streak, their hot form, with their masses of fans creating that wonderful sense of game day. But no, it happened at the Telstra Dome – or whatever it is called – with a small crowd and those who were there were probably already feeling put out by having to attend a home game at an away venue. The AFL has a tendency to overstate the centrality of football in the lives of the good citizens of Melbourne and the surrounds. And thus a crowd of some 70,000 was hoped for. Damien Hardwick and some of the Richmond players, though, should be commended for recognising that the team had done much to disenchant and disappoint the fans. The disappointment of this season being felt all the greater because of the high expectations that the Club built up over the long cricket-full summer. The crowd turned out to be 58,000. 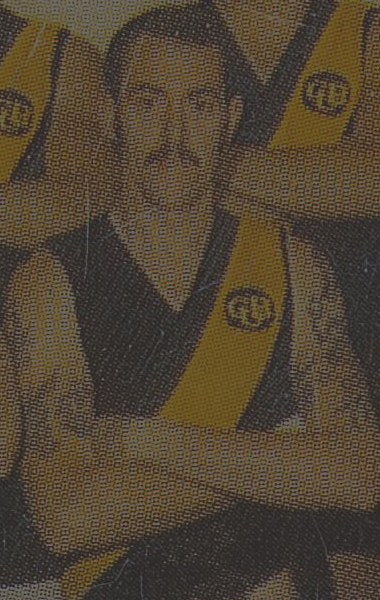 The consistent excellent form of Dustin Martin, the instant arrival of Miles as a player (after his much anticipated debut for Richmond) and the development of Riewoldt into a much more rounded player couldn’t provide sufficient succor for a team and fans expecting not only to play in the finals, but also for a win in September. The righting of the good ship Richmond has been as sure as it has been unspectacular. Until Friday night that is. I had planned to watch the game live. But, I got caught up in a long Skype conversation and so, rather than resuming watching the game from third quarter, after having seen most of the first quarter, I watched the full replay from the second quarter onwards, some six hours after the game’s completion. A media blackout was enforced for those hours in between. For twelve years I have loved the jumper. 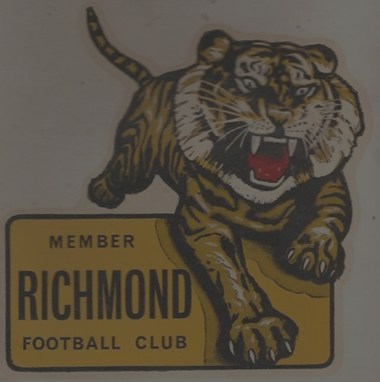 For twelve years I have been with Richmond. I have not been to as many games as I would have liked. I have been far from 3121 for the past four years. But followed them I have. Each summer, I have been convinced that the next season would be ours. Folly and naivety most think. I have admired our good players; I have respected their characters. I did my best to find something good to say about Terry Wallace during those years and many days in which he came under so much criticism. Much of it warranted. I wrote him a letter: wishing him all the best, despite the difficulties. I wrote Danny Frawley a letter after an uncouth fan spat towards him. Frawley, polite, replied and wrote of the many other fans who had also voiced their outrage. 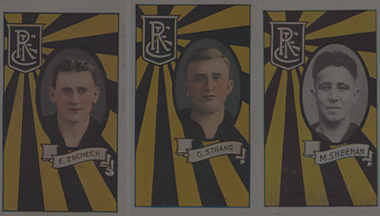 I gave Richard Tambling the benefit of the doubt: he would become a player in the right circumstances, I was sure. 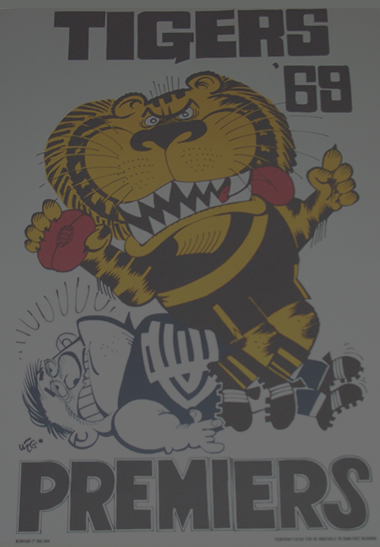 I almost cried with happiness when the Tiges thrashed the Hawks in the wet at the MCG a couple of years ago. 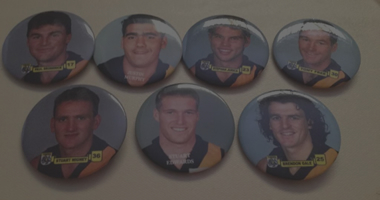 For twelve years I had loved the jumper and admired the players. But it was Friday’s game in which I fell in love with this team; with each of the players; one by one; one at a time. Purely platonic, of course – I don’t want Brian Taylor to get uncomfortable. 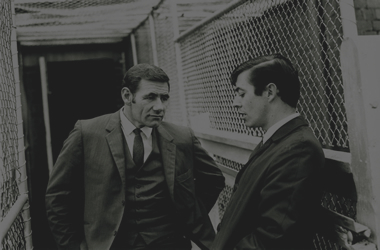 In days gone by, with the luxury of watching the replay, I would have skipped to the end. 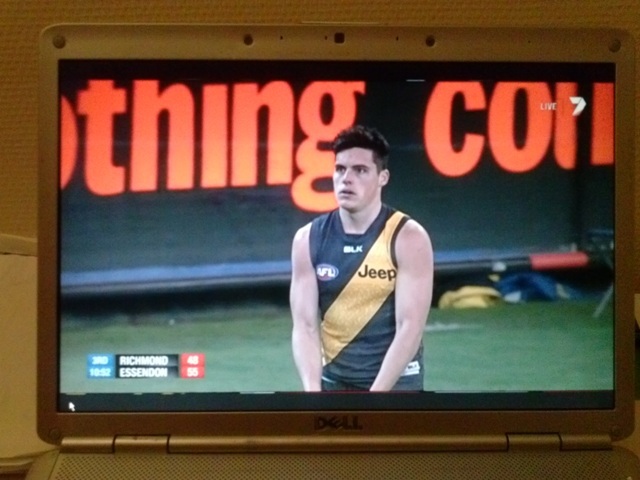 I would have checked the result on Richmond website to see if it was safe to continue watching. But this time, I stayed put. My knees against my chest, peeking out at the screen. I convinced myself that ‘surely this is more stressful than watching soccer’ – longer than 90minutes and so many chaotic possibilities. So many players who could make a single mistake that could lose the game for the team. I thought of Cameron Wood’s mistake against Freo a couple of weeks ago. I thought: how ironic – Richmond are playing so well, so beautifully – just as we want them to, but, we might suffer a tortuous loss. On the commentary, Bruce kept on writing Essendon off. I don’t know why he does it. Bruce seems to belittle the opposition. ‘One more goal here could make it really difficult for Essendon’. Didn’t he see last year’s Brisbane-Geelong game up at the Gabba? Didn’t he see the third quarter of Richmond-North Melbourne this year? 30 points means nothing. 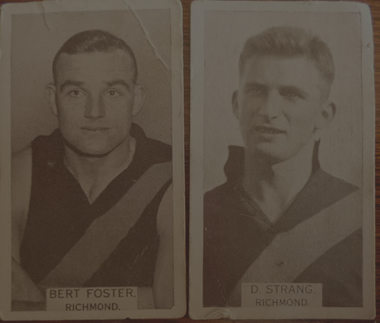 But despite even Bruce’s best efforts to put the Mozz on Richmond, the Tiges didn’t wilt. I saw the superb skills of Dyson Heppel: a player I couldn’t really appreciate up until now. 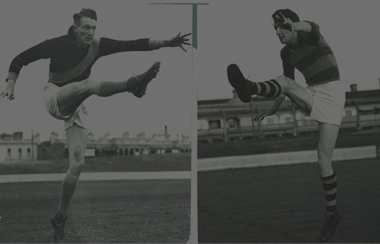 I saw the stoicism of Paul Chapman; the ingenuity of Goddard: two players who were perpetually on teams humiliating my, your, our Tiges. Tonight, not so. I see Goddard depart the field: frumpy and bad-tempered. His nose put out of joint with this team now in jeopardy of missing the finals. Enough of them. Brett Deledio: let him be underrated never again. He is athlete, aesthete, footballer. Edwards: so light on his feet, adroit, lithe and balanced. Miles: the man is tenacious. Gordon: he came to the fore – not for long, but, when his moment came he was there; and he delivered. 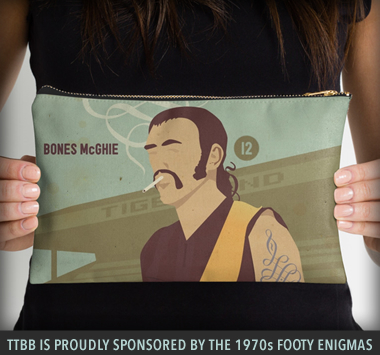 Griffiths: the MCG is your play thing. But my moment of the match came a few seconds after Ivan had marked Ben’s long kick into the forward line during the game’s dying moments. Ivan lined up; the siren sounded –the crowd roared, roared, roared. And Ivan – did not blink. No smile, no relief, no nothing. The man was looking in between the goals: that is where I shall send the ball. And goal he did. 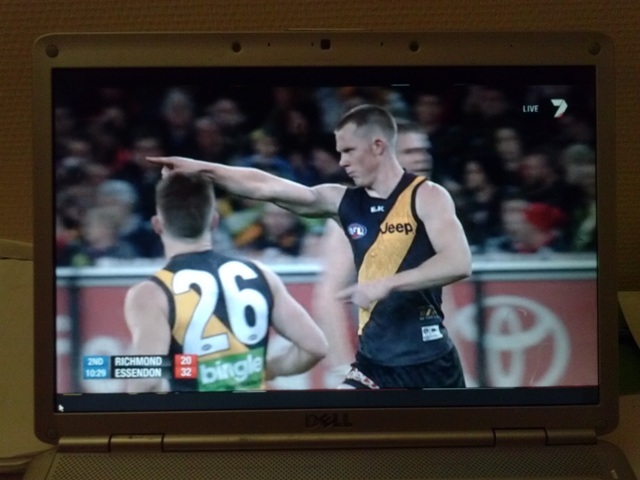 No concentration lost by that booming projection announcing the Tiges as victors. 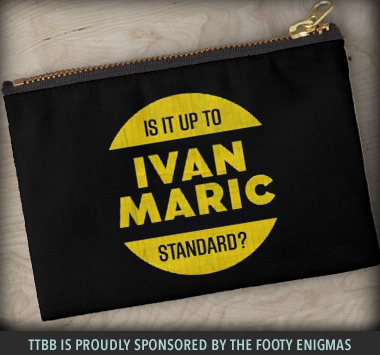 Ivan the Maric. And the team swamped him. This was a win for the Believers. 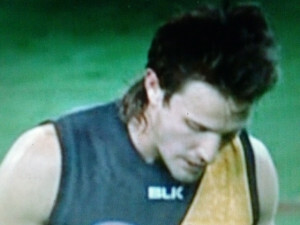 Ivan believed in the Tiges when he no doubt told the Team that they could be better. Ivan believed that the Team could respond to criticism; to take it on board and then improve and improve some more. Ivan leads by example and the Team follows. This was the Beautiful Game.